Ilayathalapathy Vijay is always known for his caring and affection towards his team members, and now he has proved it yet again by serving Biriyani for the ‘Puli’ crew. It is well known that Ajith personally cooked biryani for 150 plus people on the sets of Billa 2 and served the team. 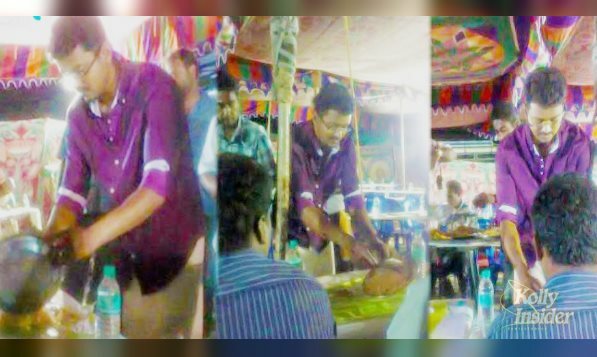 Now our Ilayathapathy did same sort of act, The actor has served a delicious Biriyani dinner for the crew members, and this is considered as his act of thanks to the team which is showing some wonderful performance in the sets. As per reports, Ilayathalapathy and the crew is now shooting a peppy song for the movie. Earlier, Vijay gave a special dinner for Bollywood Diva Sridevi in his home. The entire crew is so much impressed about the hospitality of Vijay. All of them firmly believes that this film will emerge as a blockbuster in theaters. ‘Puli’ is directed by Chimbu Devan, and it is touted to be a fantasy entertainer. For the first time in his career, Vijay is doing a triple role in this movie. Sruthi Haasan and Hansika Motwani will do the roles of lady leads, while Sridevi will enact another pivotal role. Kannada Superstar Kicha Sudeep is reportedly playing the role of the main antagonist. Sudeep is not a new face for the Tamil audience, as he is known in Kollywood as the ‘Eega’ villain.